Explore Madrid and its historical center during a sightseeing tour of the city's most important sights, beautiful green areas and the picturesque streets. The Madrid Historical eBike Tour takes you on a 2-hour city tour that will lead you to many historical sites in the center Spain's capital. 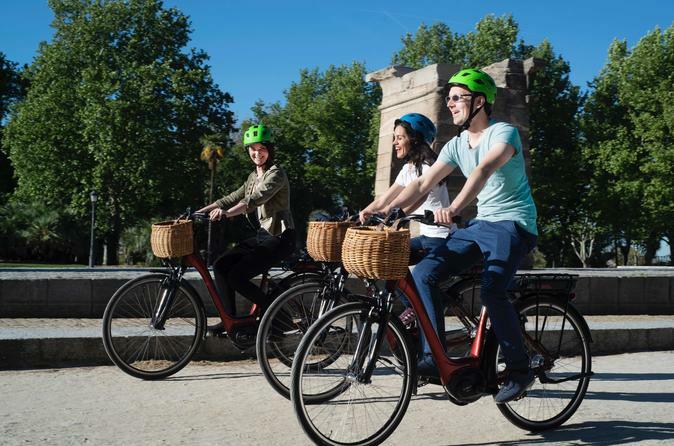 Explore Madrid by ebike without any effort and see the amazing old town as well as the recently refurbished area around the Manzanares River. This fun tour through the nicest quarters of Madrid includes many monuments, picturesque squares and old streets, as well as beautiful parks and the city's typical old town. The tour starts at Plaza de España and will first take you to the Temple of Debod, an Egyptian temple that was rebuilt in Madrid in the mid 20th century. Near the Manzanares river you will visit the Puerta de San Vicente and the Campo del Moro, the Royal Palace and the cathedral, la Catedral de Almudena. Next, the tour continues to the Royal Basilica San Francisco el Grande, a unique Christian church with one of the world's biggest domes. Then, you will enter La Latina, a lively district with many restaurants and bars. From there, the route leads you to Plaza Mayor, one of Madrid's biggest old squares, and to the small streets and plazas of the old Madrid de los Austrias quarter, until you will arrive at the famous Plaza de la Villa where the city council was located from the 1700s until the early 21st century. Afterwards, you will visit Plaza de Oriente and finally, before returning to the start point, the Teatro Real, Madrid's famous theatre that first opened its doors in 1850.